Since our founding, Forest Lawn has committed itself to providing outstanding service and beautiful environments for family outings, remembering loved ones, and commemorating holidays. Whether you are planning how to help your loved ones remember you, memorializing someone special in your life, or joining us for holiday events like Easter or Memorial Day, we invite you to visit Forest Lawn. Do you need to make arrangements for yourself or your loved one? Give us a call anytime, day or night. 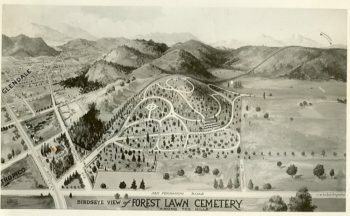 Since its founding in 1906, Forest Lawn has been an integral part of the community it serves. Our Founder, Dr. Hubert Eaton, profoundly changed the funeral business by transforming Forest Lawn Memorial-Park into a place for the living. By combining the mortuary and cemetery sides of the business, Eaton achieved his goal, making Forest Lawn a beautiful setting for services, weddings, baptisms, and family excursions. After 100 years of service, the Forest Lawn Memorial-Parks remain a place for the living and a true community resource. Community outreach and involvement have been part of Forest lawn’s commitment since the organization’s beginning. 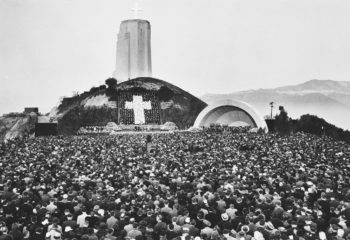 From the first Decoration (or Memorial) Day in 1915 and first Easter Sunrise Service in 1921, Forest Lawn brought its spirit of celebrating the living and honoring the past to its communities. Our annual candle-lighting ceremonies help people remember and honor their lost loved ones. Throughout its community involvement, Forest Lawn has celebrated life and its meaningful memories.